HomeExclusiveThese Himba Women Invite Baby in Their Womb With a Birth Song! The land of natural beauty where nature still breathes in its freshness, Africa is also home to some of the most captivating, interesting and oldest tribes of the world. Small tribes like Zulu, Masaai, Himba and many more survive in the extreme climatic conditions of the continent. 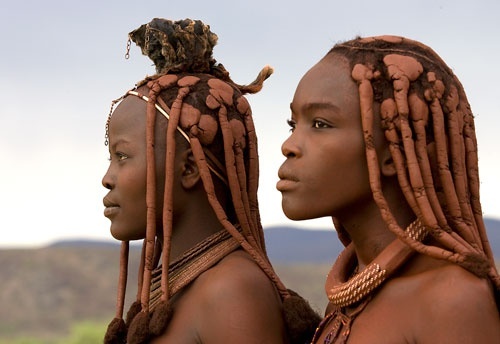 But of all the African tribes, the Himba tribe and its women hold a special mention for their customs and rituals. Bathed in red ochre, from head to toe, the women in the Himba tribe not only look different but also conceive their babies differently. The story about the lives of Himba women is extremely interesting and will make you question about the old traditions followed by various tribes all across the world. Known for their beautiful features and a body that is covered in red ochre, women in the Himba tribe are not allowed to bathe in water or allowed to wash their clothes in water. This tradition was set due to great droughts which the tribe faced during the extreme climates of Namibia. Only men were allowed access to water for washing their clothes and body. Women on the other hand, prepared a mixture of herbs and coal which they began applying to not just their bodies, but also their hair. The red ochre not just protected the skin of these women from the harsh effects of the sun but also prevented growth of unwanted hair on the body. However for maintaining their personal hygiene, women of the Himba tribe take a daily smoke bath. In small bowls filled with herbs and leaves of commiphora tree, women put charcoal and allow the smoke to ascend. Once the smoke begins to thicken, they bow down over the bowl and cover themselves with blankets to trap the smoke in it. The heat cause the women to perspire which thus helps them cleanse their body. Apart from their bathing method, the Himba women are also known for their unusual tradition of conceiving a baby. In the Himba tribe, the birth date of a child is counted not from the minute it is born, nor from the time it has been conceived by the mother. Instead, the birth date of the child is counted from the very minute a woman decides to bear a child. When a woman in the tribe decides to become a mother, she goes and sits silently under a tree alone and listens carefully until she hears the song of the child that wishes to come to her. Once she has heard the song, she comes back to her man who will father her child and teaches him that song. And when they physically unite to conceive the child, they sing the birth song, inviting the child to come to them. Once a Himba woman becomes pregnant, she teaches the Birth song to the midwives and the elderly women of the tribe so that when the baby is born, the women can sing the birth song to the child and welcome it into the beautiful world. So, when the child grows, the birth song is sung to the child in every phase, even when he/she falls down or cries or does something wonderful. The song is also when the child reaches its puberty stage. Apart from all these occasions, the birth song is also sung when the person commits a crime. The person is made to stand in the village center and then people of the community hold hands and circle around him/her, singing the Birth Song, reminding him/her of its origin, its innocence and embrace its identity. The Himba tribe believes in Correction and Not in Punishment! The Birth Song is sung on all important occasions of the person until his/her death. This is the importance of the Birth Song in the lives of the people belonging to the Himba Tribe. We may not have been born in the Himba tribe, but there are always songs that touch our souls. So, just keep singing and humming these songs and you shall always stay happy.